Circumstance (and a chronology that only makes sense to me) seems to be dictating quite a few less than great posts at the moment... but as always I take solace in knowing that many enjoy these more than I; the rest of you will have to bare with me. (Burman's up next). Quickly then: Even more Naushad (and I find myself wondering how come I have so many of his), 'Mere Mehboob' is a bit dull I think. None of the songs are very memorable ('Aye Husn Zara Jag' and 'Jane Man Ek Nazar Dekh Le' are OK) and there's nothing particularly interesting going on in terms of instrumentation or arrangements... so probably the least exciting of the scores I have of his. Amazing blog!! Just discovered it. Gem after gem here, they just keep coming. Do you happen to have a Burman soundtrack called "Heera Panna"? Thanks once again PC for the album !!. Really looking forward to your Burman soundtracks. On a side note, since 'Heera Panna' was mentioned above, would like to add that RD was a master at western-type music and fusion, and he may have experimented with it more than his father, but SD was also strong in this aspect as he showed many a times in his music. I know of many who credit RDB with "all" or "most of" SDB's western-type songs, and IMO that is not giving SDB the credit he deserves. Before RD became SD's assistant, and even after RD left to concentrate on his own films, SD's strong hold over western music can be seen in his songs. Sure RD had a hand in a selected number of the western-type songs of SDB, but SDB also was strong in western music. On the other hand SDB was a master at traditional indian music, but RD was also talented in this area, as he showed. What is great is that both father and son had similarities in their music, even if they had their own signature and trademark styles. They also both used similar assistants. Hey PC, I know you're a big fan of RDB's western stuff (I am as well), and if you want to explore more of RD, check out his traditional classical-type albums like Kinara, Mehbooba, Aandhi and Amar Prem, he was a versatile composer. I forgot to mention, those RDB traditional albums (listed above)are all excellent, and worth listening to. Would you happen to have any of them in vinyl ?. I've already posted Mehbooba, and I think I have Aandhi, not the two others though. My bad, I forgot you had posted Mehbooba. You're very generous in sharing your excellent collection, Thank you so much for all the albums !!. AS You said - This time Iam writing in disagrement with you. PC bro it will be best if you also add tht your views are respect to music you like or say western beats or orchesta etc. Even if you dont like any album...do chek if the songs are based on Indian classical music or not. because you will get lot of such albums which didnt dont ve lot of Western instruments. so surely will disapoint you ! 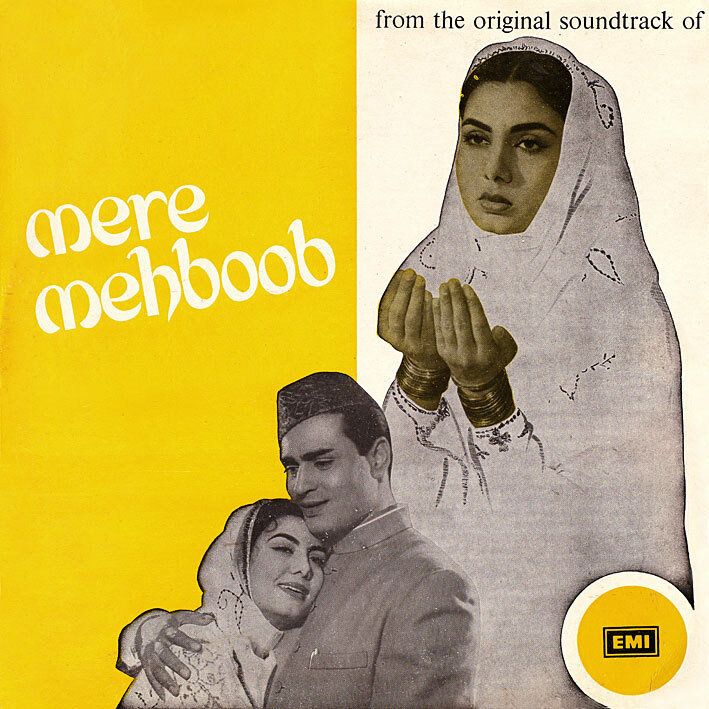 Mere mehboob is among the best work by Naushad saab. Naushad saab is a legend in India....and lot respected due to his insistence on Indian classical music and Raagas. The whole album is very popular in India. I think this didnt appealed to you as most of the songs had Indian touch or say had Hindustani( pure Indian) instruments used. But I can assure you tht these songs are very popular in India. I hope you wont take my disagreement in wrong way ! I like your blog. I am fan of hindi oldies. and wanna start my blog on records of hindi movies.